President's Message November 2018 — Flathead Wildlife, INC.
Let’s hear it for the ladies. I’m one of those lucky guys whose wife likes to hunt and fish. She doesn’t go at it the way I do, she likes to go a little slower, doesn’t need to go dawn to dark, she likes to smell the flowers, she doesn’t think being cold, wet and dirty is all that much fun and it is mostly about putting meat on the table. Our neighbors came home last weekend, the Dad and sons had seen and passed on some small bucks. The wife went out mid-day, found a nice 2 point whitetail that looked tasty and tender and happily bagged it. My wife and I get to spend some great times together and as a result she is more understanding of all my piles of gear, the early morning departures, dragging in after dark and my insistence that I need to make this trip right now to catch the bite/moon/snow/weather… Women make up half our population but are greatly under-represented in the outdoors. But they are a fast growing segment and that is important in the face of an aging hunting population and declining numbers. Take the time to introduce someone to eating wild meat, encourage them to go along, even if only with a camera. Take it slower, pick nice days. You’ll both be happy. The other part of the female equation is does and cows. 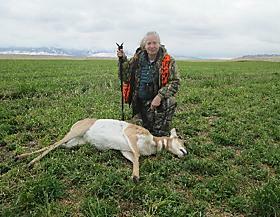 Montana has some booming big game populations right now in many districts. Daily bag limits and permits are very liberal in trying to stem population growth. I’ve been fortunate to shoot some great bucks and bulls through the years. But my household also hasn’t purchased beef for home use for more than 40 years. We like wild game and does and cows usually eat better than their male counterparts. I’m at the point where given the choice between a mediocre buck and a doe, I’ll take the doe. My first archery elk I chose a cow over a spike bull because she presented a better shot. I’ve usually shot the first legal elk I’ve seen, it just happens I’ve seen a number of bulls first. These days I’m saying I’ll choose a cow over a rag horn bull, I hope I get to test that theory. And I’ll be honest, if there’s a 6 point in a herd, all bets are off. I had an unwelcome surprise opening morning. Three miles up a road I’ve used for 25 years there was a “Private Road, No Trespassing” sign. There’s 4 more miles of road beyond there to Forest Service. I checked, it looks like the new owner of 35 acres can close the road and shut off access to hunters to thousands of acres of Stoltze, Weyerhauser and USFS lands. I could hike around the new parcel but hiking 4 miles just to start hunting is a little daunting. It will be an even more bitter pill if the new landowner continues to drive the 4 miles of road to hunt. Flathead Wildlife is also looking at a new private gate near Olney that could potentially block a long used road. Again, the road is private and the possible closure would be legal. There are lots of those types of roads in northwest Montana that the public is happily using now. FWI will be trying to identify those and come up with access solutions before the signs and gates go up. There are some options, the Governor’s Office has a Public Lands Access Coordinator and FWI is asking him to come up here so we can explore some of the options to keep roads open including right of way purchase and easements, tax credits and explanations of landowner liability. As we detailed in the last newsletter, there are 1.5 million acres of federal public land landlocked and inaccessible in Montana and also thousands of acres of state lands you can’t reach. We’ll keep working on your behalf to continue to access the public lands we all own. The preceding opinions are mine alone and don’t necessarily represent the polices of Flathead Wildlife, Inc.